The old "Fifth", raised in 1674 in Dutch service as "The Irish Regiment", or Viscount Clare's Regiment, amalgamated in 1968 into the Royal Regiment of Fusiliers. The regiment raised 52 battalions for service during WWI. I'm putting this link to a thread on the Armed Police Mutiny, Aden, 1967 here as the thread is posted in another sub-forum & may be overlooked. Trumpeters of the Northumberland Fusiliers, a TF unit? Note one man has his trumpet banner affixed the wrong way round. I have a 14-15 Star to a member of the 23rd battalion Northumberland Fusiliers (Tyneside Scottish), he died of wounds in August 1917 at the grand old age of 16 years and 2 months. He was 14 years and 1 month when he arrived in France. His Star has the prefix 3. Not quite a badge so I hope you don't mind this addition. Sounds like an very nice star, what are his details on CWGC & Soldiers Died? 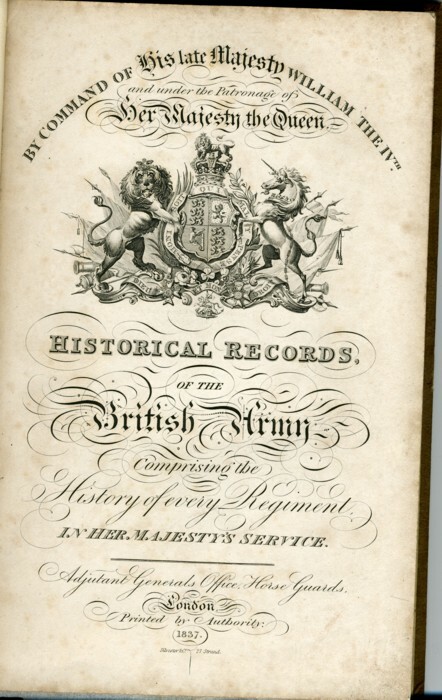 Feel free to post anything relevant to the regiment - I thought I'd start off loads of threads on various regiments, badges, photos, medals, postcards, colours, whatever, it's just easier to put & badges & photos" in the title than "everything". Just start a thread on a regiment & let's keep the stuff coming. Grave/Memorial Reference: I. E. 17. 3-8472, Pte. 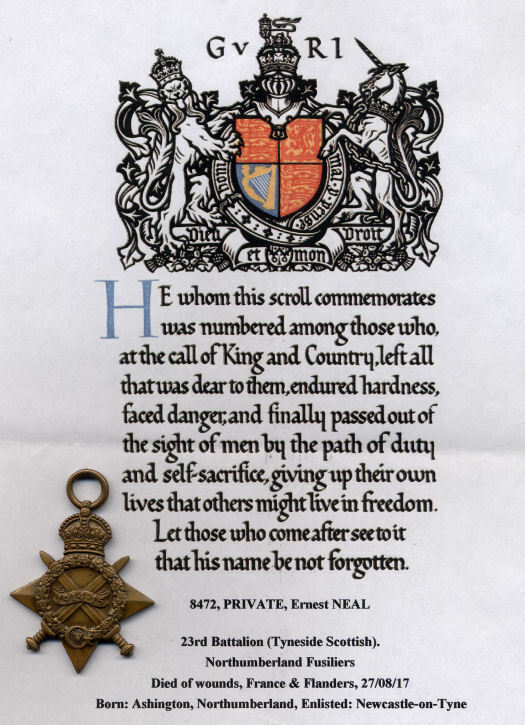 Ernest Neal of the 23rd battalion Northumberland Fusiliers (Tyneside Scottish) died of wounds on 27.8.17 and is buried at Tincourt New British Cemetery near Peronne on the Somme. The village of Tincourt was a casualty clearing station from May 1917 until the retreat on March 23 1918. Ernest was born in June 1901 at 29 ? Humber Terrace, Ashington, North Seaton in the district of Morpeth, Northumberland and was the only child (in 1901) of Thomas and Margaret Neal. Ernest enlisted at Newcastle-on-Tyne and arrived in France on 15.7.15 at the age of just turned 14 years. He died of wounds two months after his 16th birthday, probably one of the most battle hardened 16 year olds on the front. His wounds may have been received the day before as his unit suffered 32 OR wounded during an attack. 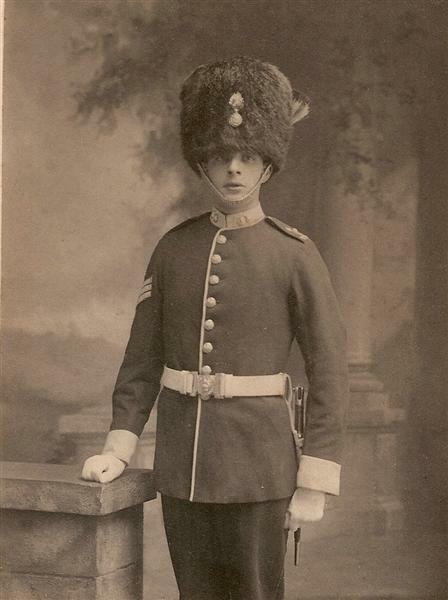 He also served in the 9th and 12th battalions of the Northumberland Fusiliers. D Coy work under 207th Field Coy. R.E. digging. STRONG POINTS in the captured system and firing in front of captured trenches. ZERO hour fixed for the attack 4.30 am. Immediately the attack commenced our carrying companies which had during the night been standing to man their respective "dumps" in HARGICOURT followed over NO MANS LAND in the wake of the attack battalions as above mentioned to whom they were responsible that a copious supply of RE material, bombs, ammunition was got forward to their position. In spite of the fact a heavy hostile artillery barrage was put down on NO MANS LAND and on the original BRITISH FRONT line, the carriers did their job with remarkable coolness and gallantry, arriving at the objective and dumping their loads within half an hour of the time attacking troops reached this point. Enemy shelling in the HARGICOURT area was intense throughout the whole of the day, enemy making free use of gas shells. B & A Companies whose refilling bombs were near THE EGG were instructed to evacuate the area by 101 Bde. shift on account of the concentrated enemy shelling in this locality. Casualties were fairly heavy in all Companies with the exception of "B". The latter Company constructed a STRONG POINT in captured system at F.30.C.85.00 other work could not be proceeded with during the hours of daylight in this neighbourhood, hostile M. Guns and snipers from direction of TRIANGLE TRENCH being specially active. Companies still in same position and engaged on work similar to 26th. From early morning of the 27th throughout the night rain fell incessantly accompanied by a strong wind. Trenches were now in a deplorable condition in places about waist deep in mud, and in many instances carrying parties had to be dug out of this morass. In spite of the very bad conditions carrying was continued during the hours of darkness. Men everywhere were soaked to the skin with no adequate shelter. Hostile shelling not quite so intense, sniping and TM Gun fire active, parties being specially exposed in No mans land. INTERMEDIATE LINE, neighbourhood of COTE WOOD relieving 24/27th N.F. in this area. Battalion took over left sector of 102nd Bde. front night of 31/1st Sept. relieving 20th N.F. (1st Tyneside Scottish) A, D & C Companies found B Company in support. 103 Bde. (9th N.F.) on our left. 21st N.F. (2nd TS) on our right flank. Just got back from working away and saw your addition to Leighs post regarding your relative, and please except my apologies but there are some errors in the information that you have on him. 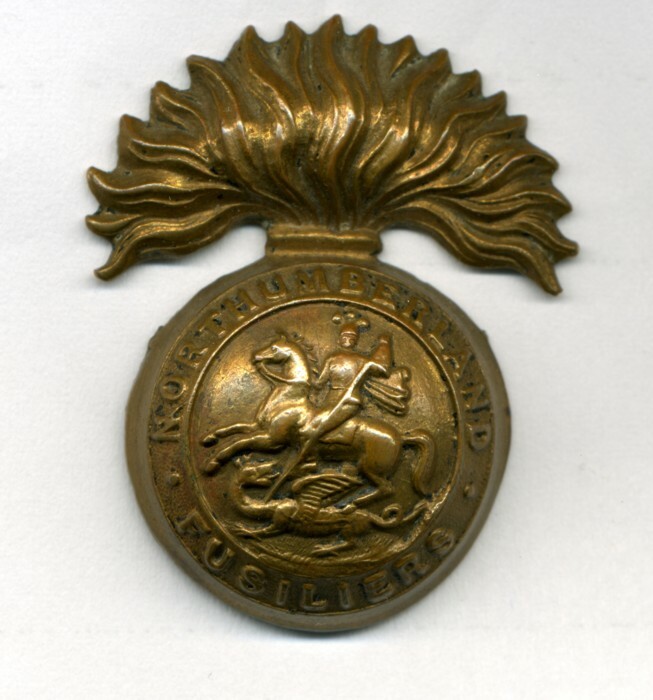 Firstly he wasn't an original member of the Tyneside Scottish, he did infact enlist into the 3rd(Reserve)Bn, Northumberland Fusiliers, which is why he has a '3-' prefix to his number 3/8472. The 3rd(Res)Bn, were Special Reservists which were formed from the old Militia in 1908, although I do know for a fact that he isn't a pre-war Reservist and he is a wartime enlistment. At the same time that number 3/8472 was issued in August 1914, again my records show that a Pte 3/8461 Pte John Devlin of Low Walker had enlisted on the 8th August 1914 and considering all regimental numbers were issued in numerical order and Devlin is a mere 11 numbers in front then it's obvious he enlisted at the same time. 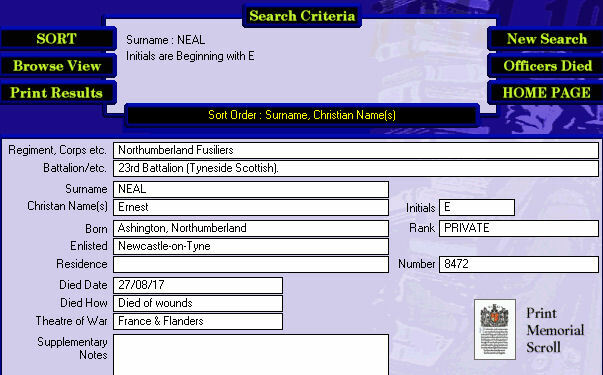 His place of enlistment is Newcastle, but the 3rd(Res)Bn were actually at Scotts House Camp, East Boldon, Durham, which is where most of the recruits into the battalion did their training. 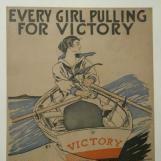 Nor did the battalion serve overseas as men were transferred from it to other NF Battalions. In your relatives case it was to the 9th(Service)Bn,N.F. and it was with them that he was wounded on the 5th July 1916, which is mentioned in the Battalion War Diary. The wound was later announced in the regimental journal, but not until September 1916, but this was mainly due to the masses of Somme casualties and delays in reporting. On recovery he moved to the 12th(Service)Bn,N.F. and was either wounded again or taken ill as he was then posted to 'A' Company, 23rd(Service)Bn,N.F. 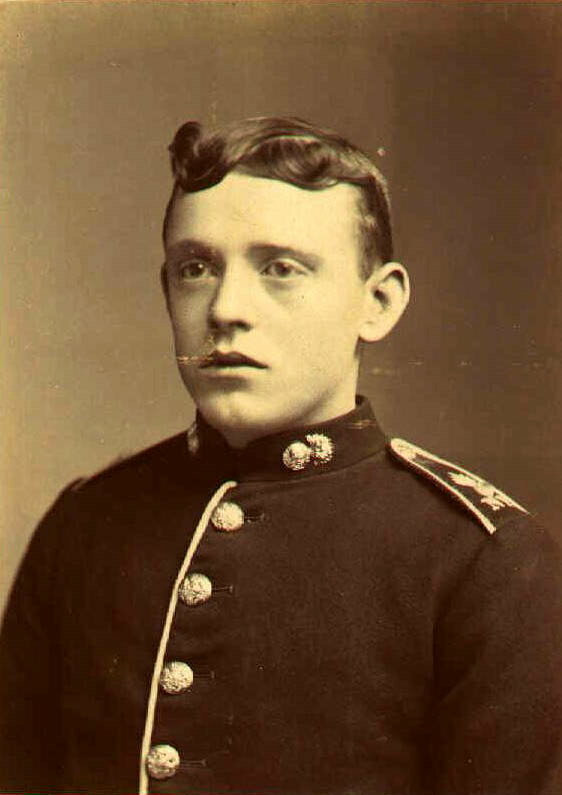 (4th Tyneside Scottish) with whom he was killed. There is a twist to this though as I believe his Medal Roll Sheet shows him again serving with the 12th Bn,N.F. after the 23rd Bn. Cracking NF photo, wheres that one turned up from? 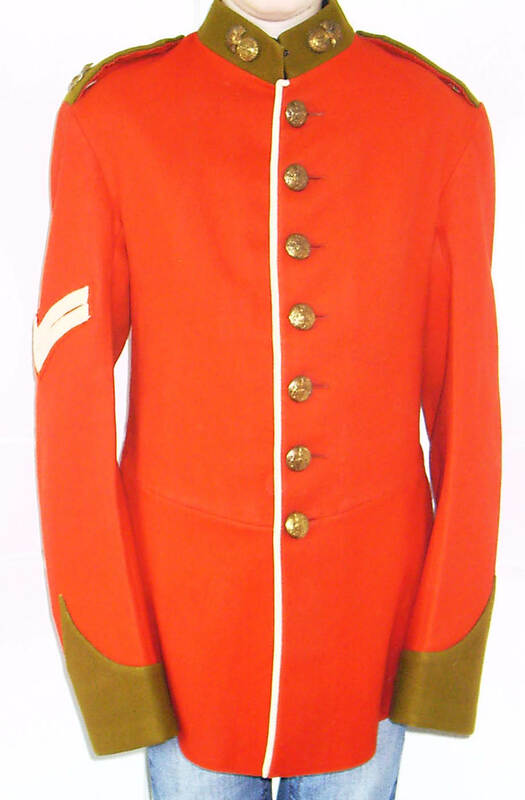 Anyway not so sure that they're Territorials, but do known they're wearing the 1913 pattern tunic with the new pointed shoulder strap, which didn't have any white piping to the edge. 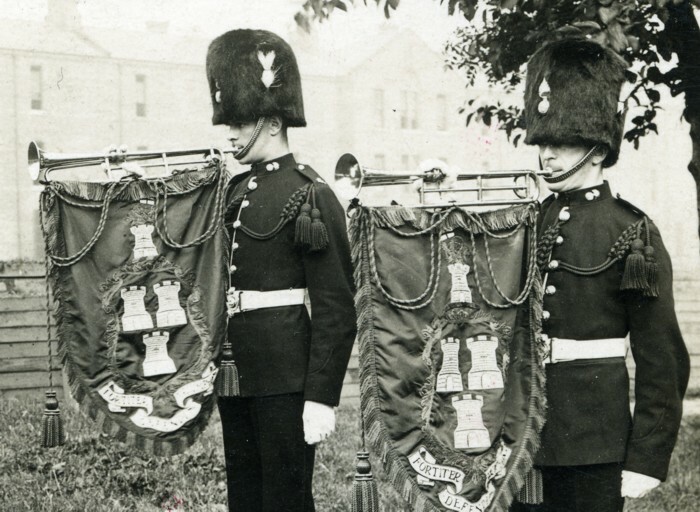 The building in the back ground could possibly be Fenham Barracks and the trumpeters banners appear to be the coat of arms of the City of Newcastle. So I'm wondering are these two trumpeters from the Depot for occassions in which the Lord Mayor of Newcastle is present i.e. Civic processions and such like? This is the 1913 pattern tunic. The new 1913 pointed shoulder strap as mentioned in my last post. Thanks very much for the info. I am now very confused though. Nice medal, and nice tunic - going spare? Is that the "QUO FATA VOCANT" or the "QUO FASA VOCANT" mis-spelling of the shoulder title? Wonder what colour the ground to the banner is, blue, Gosling Green & the fringe? I've never seen similar photos or heard of NF "state or civic trumpeters" or whatever, which is what was making me think perhaps TF. The shoulder title on the tunic is the 'Quo Fasa Vocant' pattern, but there are many O/R's patterns of the same title with the correct spelling and I think I have about six variations, mainly based on flame pattern. 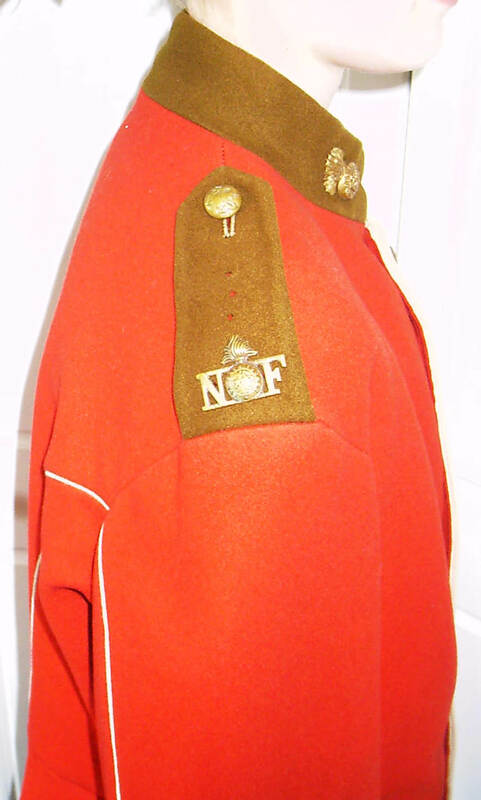 This as another NF 1913 pattern tunic, but modified years later and it is unusual in the fact that it is piped at the back and at the back of the sleeves which may indicate being worn by the 'band'. The shoulder titles in your photo aren't Territorial titles, but without a date you can't really determine if they're TF or not, as post WWI they were indistiguishable from regulars, especially during civic occassions. Pre-WWI Territorials wore a tunic of a slightly different pattern to the regulars as no titles were woven into the straps. Same tunic from the side, again showing a one piece title. Notice the additional holes punched above on the strap for a Territorial 'T/numeral'. Regular wearing a pre-1913 pattern tunic with piping on a rounded scarlet shoulder strap and white worsted embroided shoulder title 'Bomb/NF'. The 1881 pattern tunic with jampot cuffs, seen c.1900/02. 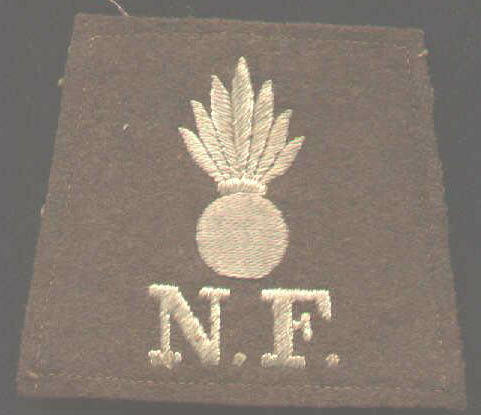 Closer magnification on his shoulder srtap shows the addition of a numeral between the bomb and NF, which would indicate the 5th(Militia)Bn, NF, as opposed to a Volunteer Battalion member who would have worn an Austrian knot on the cuff. 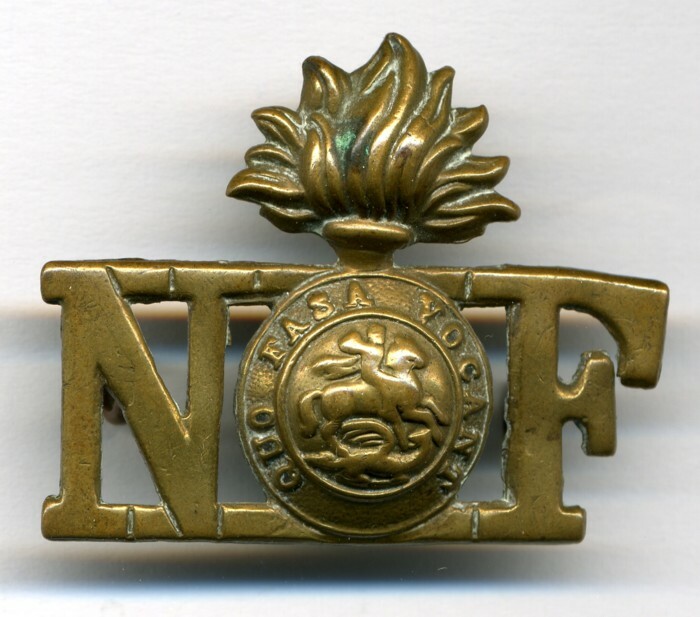 NF collar badges, in gilding metal. And this is a variety of the NF shoulder title, "QUO FASA VOCANT" instead of the correct "QUO FATA VOCANT". This is the variety shown in Grahams first photo of a tunic, the "T" spelling being shown on the second tunics shoulder title. Graham, that second tunic, I've only just noticed the additional holes on the shoulder strap - left by previous wear of the plain bomb over seperate NF or just minor damage? 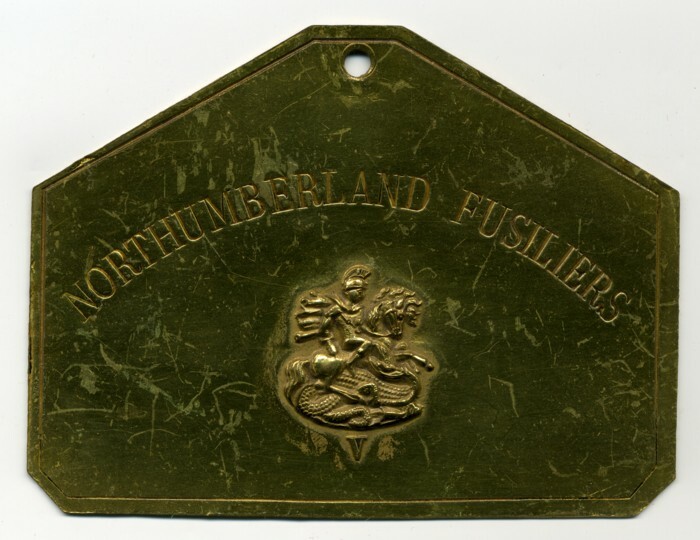 A V Fusiliers / Northumberland Fusiliers box or packing case plate? A bed, stall or garage plate? 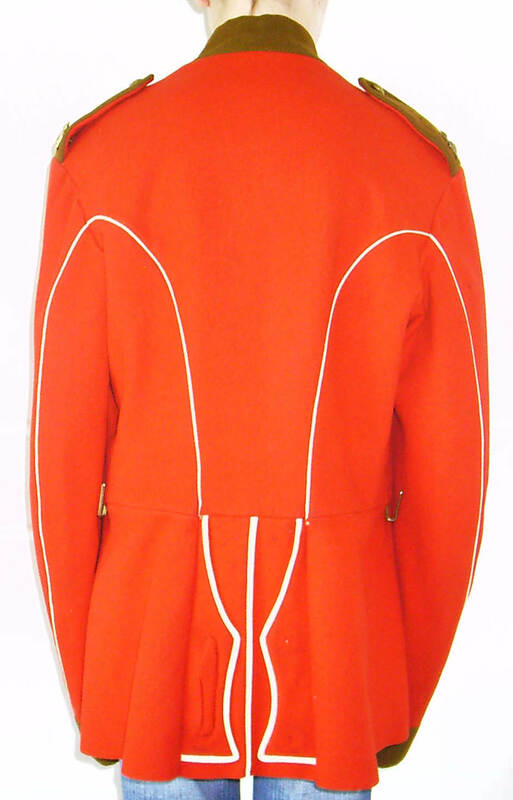 The tunic with the additional piping to the rear is for the band, as recently noticed in some St.Georges Gazettes. The holes are put in expertly put in with some sort of punch and are for a Territorial title, as there is no evidence of holes for the one piece 'bomb over NF' and besides you rarely see these titles on scarlet tunics worn by regulars, even though the embroided shoulder straps were abolished in May 1910 and the new shoulder titles introduced. It would appear that the new pattern tunics for which these titles were designed, were already going to be replaced with the new 1913 pattern tunic and so when it was introduced the new one piece 'N/bomb/F' titles were being taken into wear with it. The tunics which were minus embroided titles, but retained the round ended and white piped strap, seem to have found their way to the Territorial Force, where 'T' titles predominate. 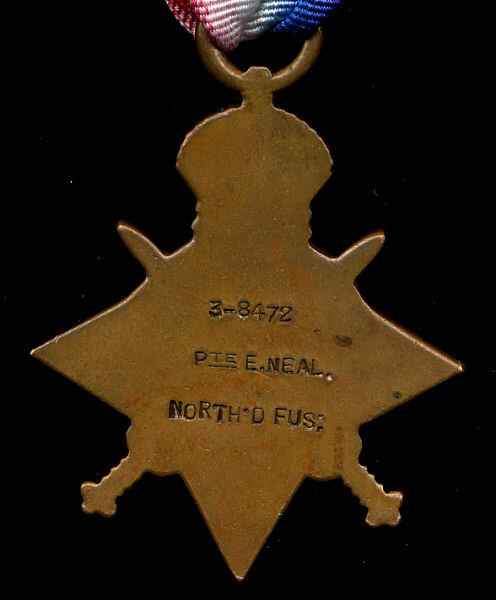 This shoulder strap shows a typical Territorial arrangement on an SD strap, but not all 'bomb over NF' titles were soldered together, nor were the 'T/numeral' soldered to it, especially during the Great War, when 'make and mend' was the name of the game. The rare cloth should title adopted sometime in late 1916, which comes in two patterns of grenade flame, was worn either on the strap itself with cloth attaching tapes or sewn to the top of the arm, just below the seam. 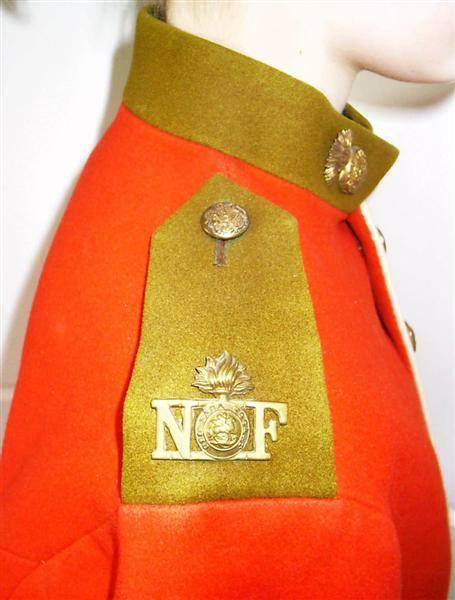 An even rarer cloth shoulder title to the 20th Bn, Northumberland Fusiliers(1st Tyneside Scottish). The coloured lettering indicated the battalion 21st were yellow; 22nd were black and 23rd were light blue. However many years ago I interviewed an old 'B' Coy, 22nd Bn man who served in 1918 and he clearly remembered the titles and when I asked was it black embroided lettering, he was quite certain his was 'yellow' lettering. By this time two battalion had been disbanded(20th & 21st) so one wonders if surplus cloth titles were being worn as 'company' indicators rather than battalion. Rather nice, I did'nt know that they used the different coloured lettering. 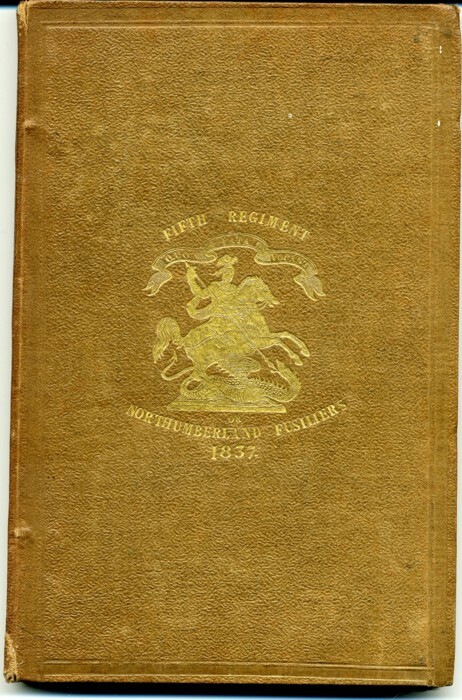 Here's a nice bound copy of The Historical Records Of The British Army" - "Fifth Regiment or Northumberland Fusiliers", published 1837, the year after the regiment was titled "Fusiliers". Nice colour to the covers, & hand blocked gilt lettering.